The following is a collection of less commonly seen photos and footage. I welcome any additions or comments. The Fedorov Avtomat (also anglicized as Federov, Russian: Автомат Фёдорова) was an automatic rifle, designed by Vladimir Grigoryevich Fyodorov in 1915 and produced in the Russian Empire and later in the Russian Soviet Federative Socialist Republic. A total of 3,200 Fedorov rifles were manufactured between 1915 and 1924 in the city of Kovrov; the vast majority of them were made after 1920. 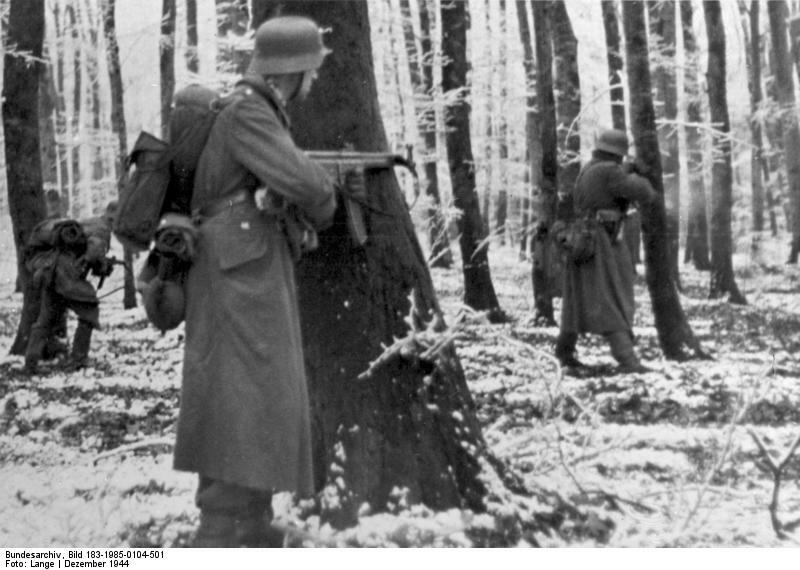 The weapon saw token combat in World War I, but was used more substantially in the Russian Civil War and in the 1939–1940 Soviet-Finnish war. 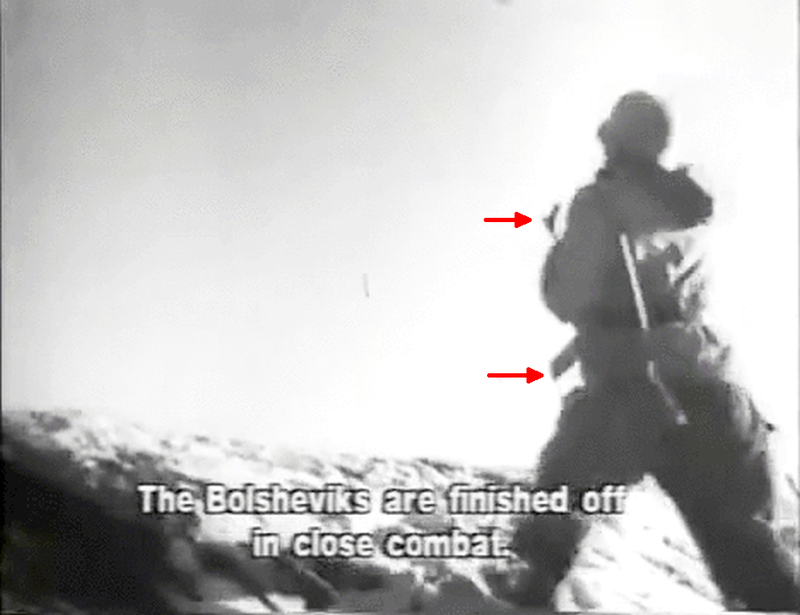 Source: WWII Battle of Russia Reel 2. The AVS-36 (from Avtomaticheskaya Vintovka Simonova 1936 model; Russian: Автоматическая винтовка Симонова образца 1936 года (АВС-36)) was a Soviet automatic rifle which saw service in the early years of World War II. The designer, Sergei Simonov, began his work with a gas-operated self-loading rifle in 1930. The first prototype was ready in 1931 and appeared promising, and three years later a trial batch of an improved design was made. In 1935, a competition between Simonov’s design and a rifle made by Fedor Tokarev was held. The Simonov rifle emerged as a winner and was accepted into service as the AVS-36. The AVS-36 was a gas-operated rifle with a short piston stroke and vertical sliding locking block. It was capable of both automatic and semi-automatic fire. The barrel was equipped with a large muzzle brake to reduce recoil. Ammunition was in a detachable magazine holding 15 rounds. 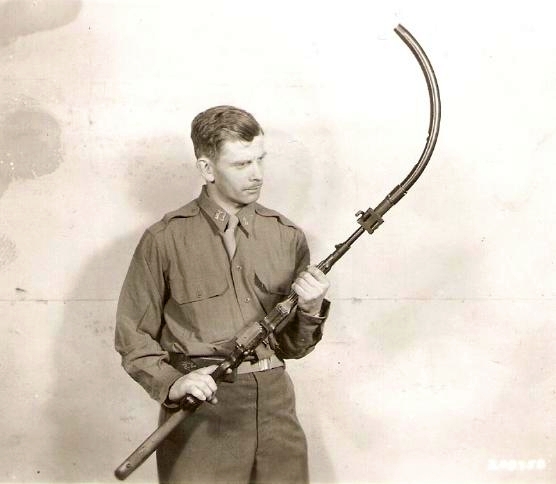 A knife bayonet was issued with the rifle. A sniper version was produced in small amounts with a PE scope. The AVS-36 was first seen in public during the 1938 May Day parade in Moscow, when it was displayed by the marching 1st Rifle Division. The American public became aware when it was covered in an August 1942 issue of the American Infantry Journal, in an article by John Garrett Underhill, Jr. Approximately 65,800 AVS-36s were produced between 1936 and 1940. Official Soviet production breakdown figures are: 106 made in 1934, 286 in 1935, 10,280 in 1937 and 24,401 in 1938. Exact production figures for 1936 and 1939 were not reported. 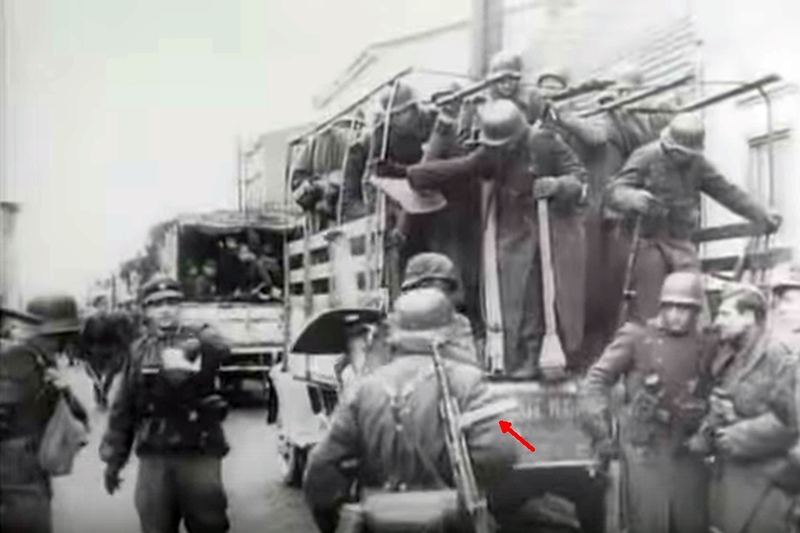 Source: WWII German Invasion of Russia | Our Russian Front Reel 1. 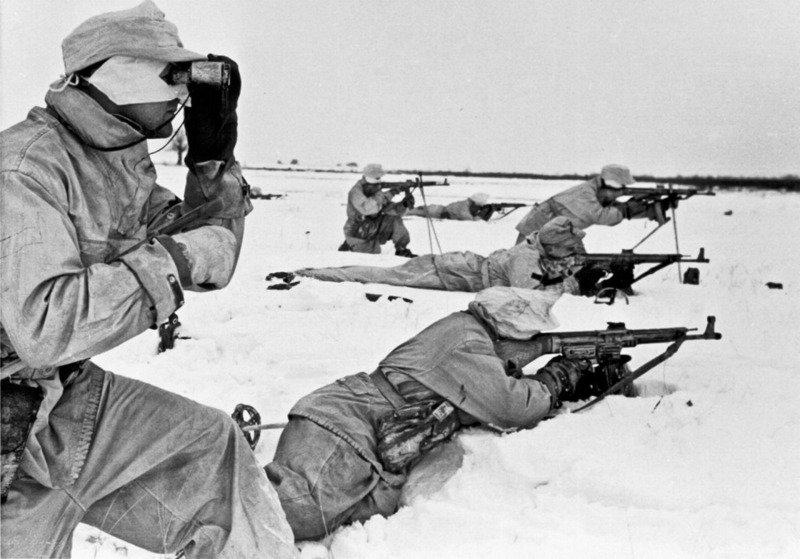 Russian soldiers on the Eastern Front, April 1, 1944. 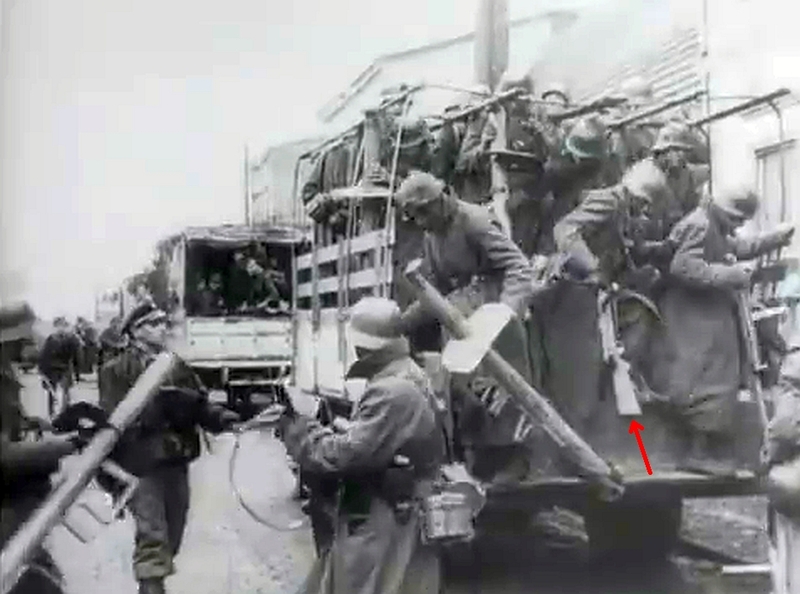 Soldier at bottom right is holding an AVS-36. The Browning Automatic Rifle (BAR) is a family of United States automatic rifles (or machine rifles) and light machine guns used by the United States and numerous other countries during the 20th century. Although the weapon did see some action in World War I, the BAR did not become standard issue in the U.S. Army until 1938, when it was issued to squads as a portable light machine gun. The BAR saw extensive service in both World War II and the Korean War and saw some service early in the Vietnam War. The primary variant of the BAR series was the M1918, chambered for the .30-06 Springfield rifle cartridge and designed by John Browning in 1917 for the U.S. Expeditionary Corps in Europe as a replacement for the French-made Chauchat and M1909 Benét–Mercié machine guns that US forces had previously been issued. Approximately 100,000 M1918 BARs were produced from 1917 through the 1950s. 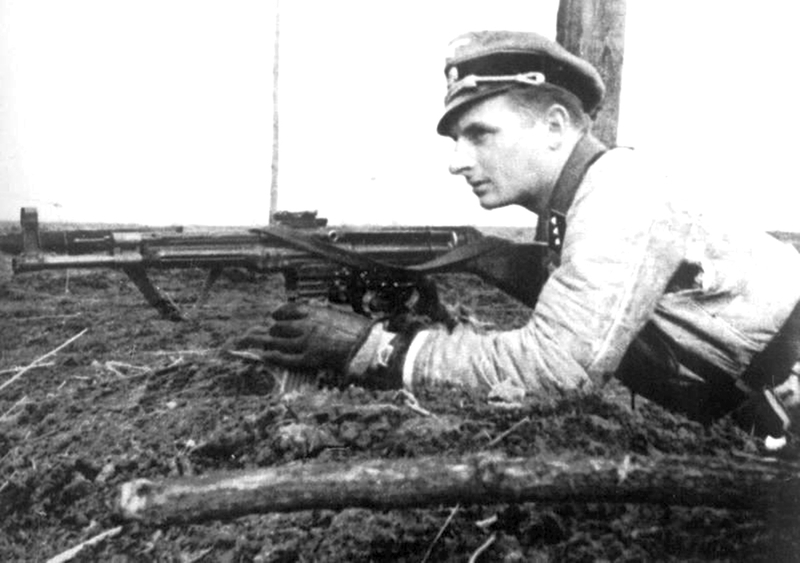 German Fallschirmjäger (paratrooper) using a Browning Automatic Rifle (BAR) M1918. Source: Die Deutsche Wochenschau 3 August 1944. BAR being test fired by Marine of the 3rd Marine Division on Iwo Jima, March 7, 1945 (D+16). The MP35 (Maschinenpistole 35, literally “Machine Pistol 35”) was a submachine gun (SMG) used by the Wehrmacht, Waffen-SS and German police both before and during World War II. It was developed in the early 1930s by Emil Bergmann (son of Theodor Bergmann) and manufactured at the Bergmann company in Suhl which also built one of the first submachine guns – the MP 18. The MP-35 was produced from 1935 to 1944. Source: Scorched Earth S4/E3 – Army Group South. During the Russian Revolution and subsequent civil war, revolutionaries, various irregular forces and common criminals cut down the Mosin–Nagant rifles to pistol size for easy concealment. Most of these rifle-caliber pistols were crudely made and lacked sights. After the Revolution, the numbers of obrez bolt-action pistols decreased as the Bolsheviks took over the imperial arsenals and gained access to stocks of Model 1895 Nagant revolvers. This unofficial Mosin variant is perhaps the rarest Mosin of them all. Obrez pistols are highly prized by collectors. Source: Die Deutsche Wochenschau 30 June 1943. The StG 44 (abbreviation of Sturmgewehr 44, “assault rifle”) is a German selective-fire rifle developed during World War II that was the first of its kind to see major deployment and is considered to be the first modern assault rifle. It is also known under the designations MP 43 and MP 44 (Maschinenpistole 43, Maschinenpistole 44 respectively). 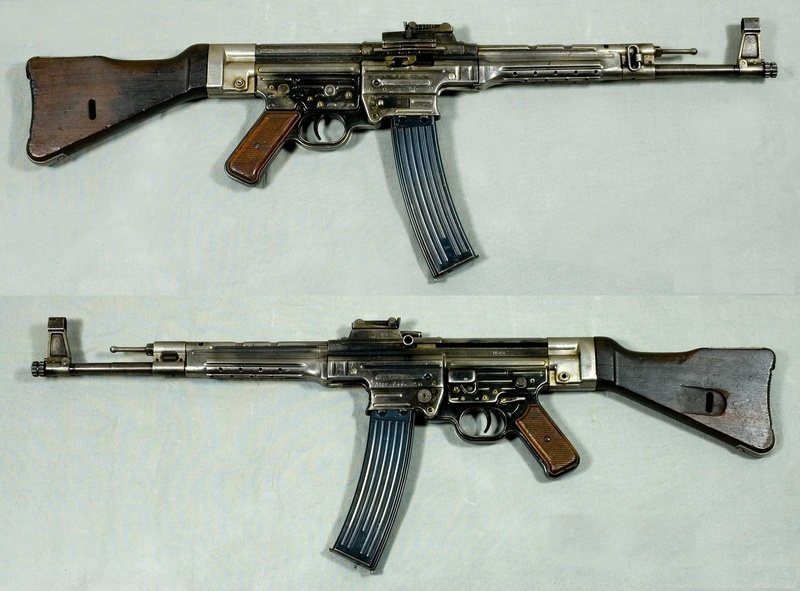 MP 43, MP 44, and StG 44 were different designations for what was essentially the same rifle with minor updates in production. The variety in nomenclatures resulted from the complicated bureaucracy in Nazi Germany. Developed from the Mkb 42(H) “machine carbine”, the StG44 combined the characteristics of a carbine, submachine gun, and automatic rifle. 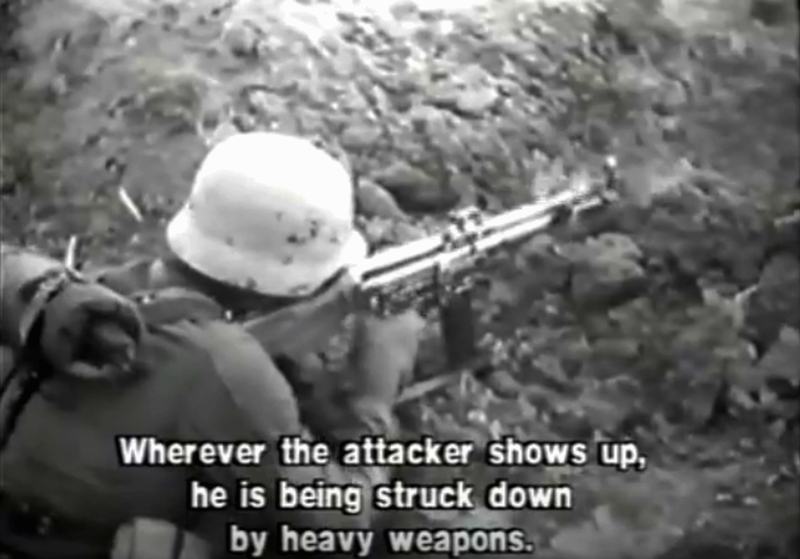 According to one account, the name Sturmgewehr was chosen personally by Adolf Hitler for propaganda reasons and literally means “storm rifle” as in “to storm (i.e., “assault”) an enemy position, although some sources dispute that Hitler had much to do with coining the new name besides signing the order. 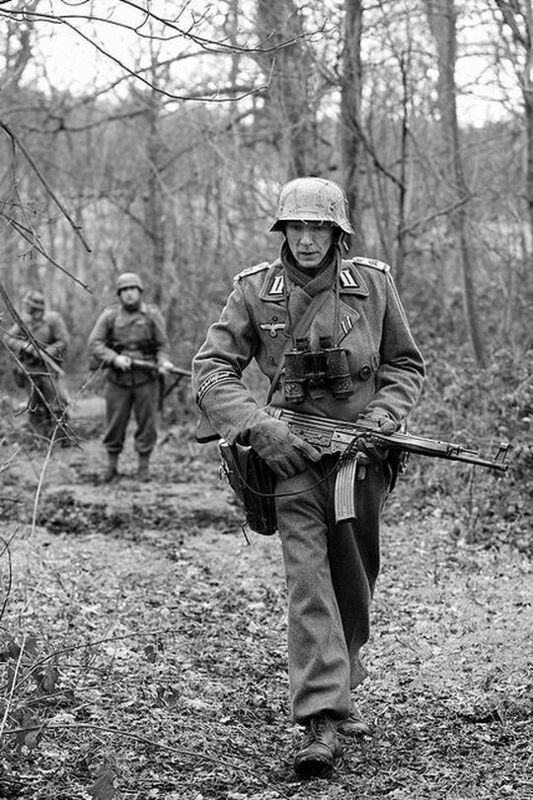 The StG 44 was the first successful weapon of its class, and the concept had a major impact on modern infantry small arms development. Highly advanced for its day, the StG-44 appeared in the battlefield in late 1944 and badly surprised those on the receiving end. Postwar, it served as the kernel for the design of the Russian Kalashnikov AK-47, the most successful assault rifle of the postwar period. 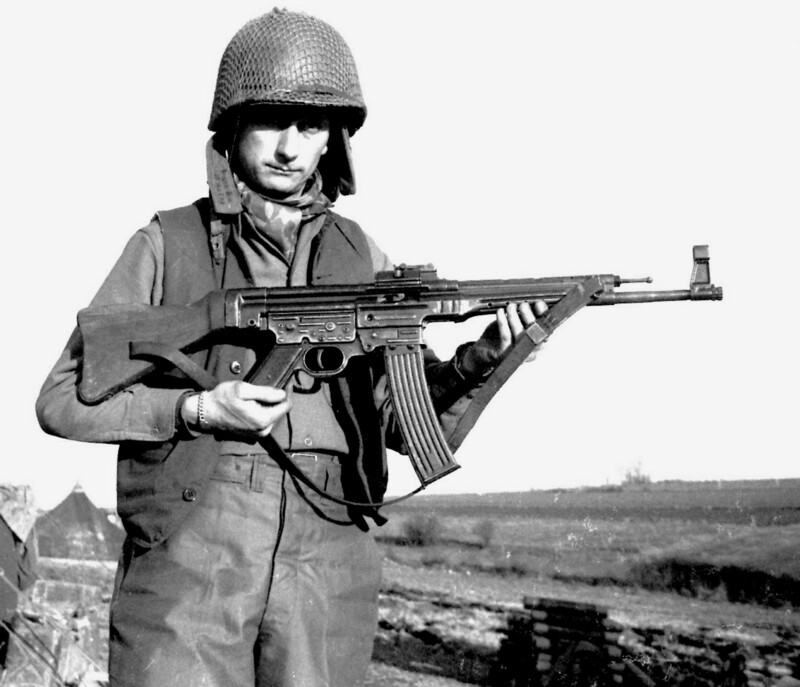 Private First Class Alvin Glascock with an StG-44 (MP-43/1). 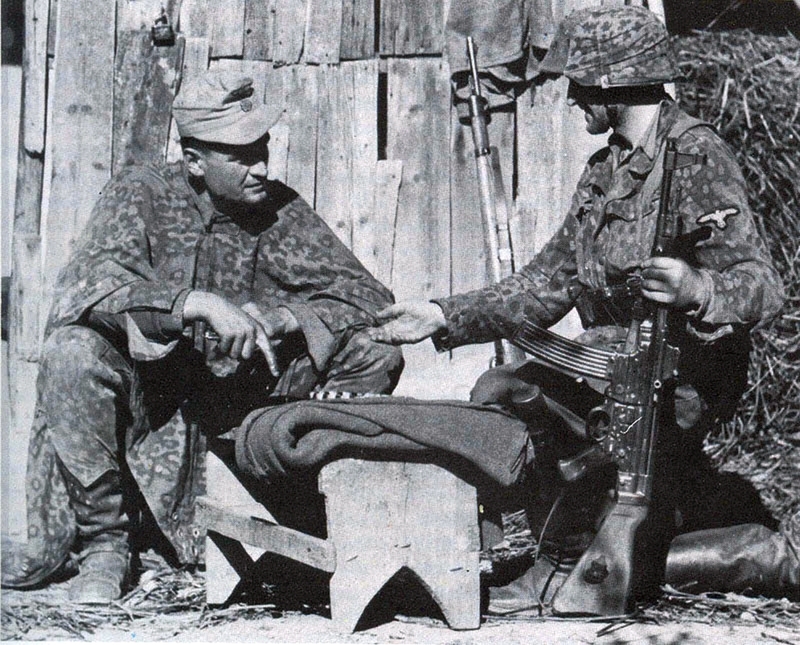 Two American soldiers examining an StG-44 / MP43. 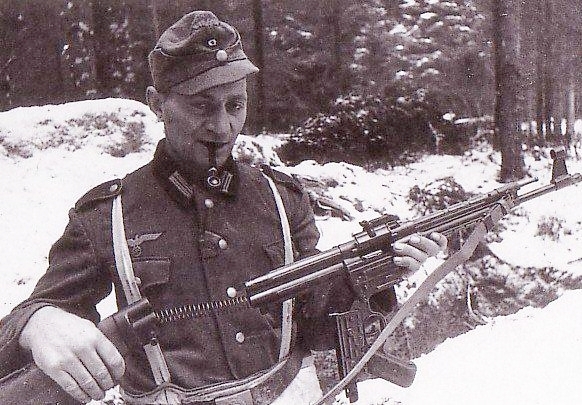 Waffen-SS soldier with an StG-44. 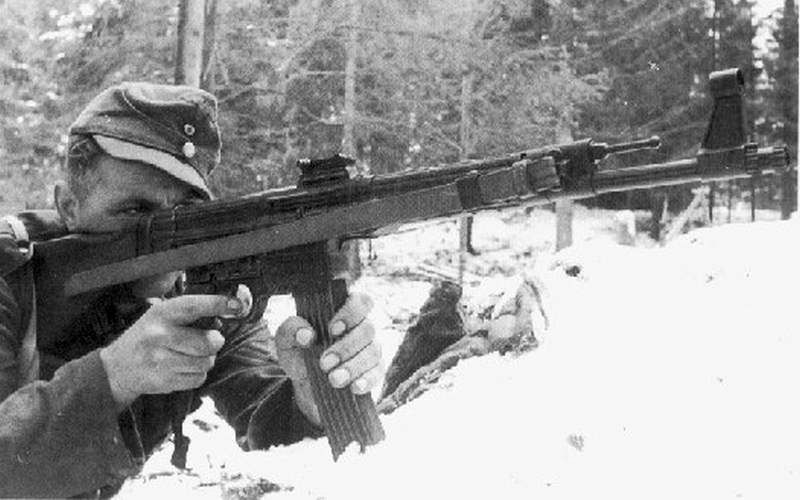 StG-44 fitted with a Krummlauf which was used to shoot at varying angles. 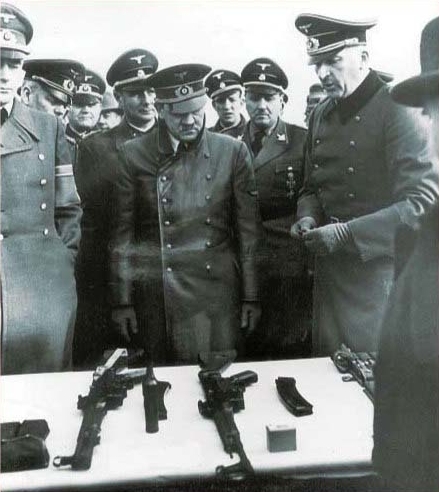 Hitler looking at weapons including an StG-44.